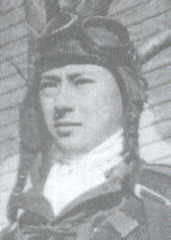 On June 22, 1945, Ensign Haruhiko Kawa took off from Kanoya Air Base as pilot in a Zero fighter carrying a 500-kg bomb and died in a special (suicide) attack off Okinawa. He was a member of the Jinrai Butai (Thunder Gods Corps) 1st Bakusen (Bomber Fighter) Squadron. After his death in a special attack, he received a promotion to Lieutenant. He was from Fukui Prefecture, attended Hokkaidō Imperial University to study entomology in the Agriculture Department, and was a member of the 14th Class of the Navy's Flight Reserve Students (Hikō Yobi Gakusei). The cherry blossoms that were in full bloom already have fallen. Lamenting that cherry blossoms could not be late in falling, while waiting intently for the day of my sortie to come, in the end heaven has not forsaken me. This evening orders were received for all Tsukuba Squadrons from the 8th to the 13th to go into action. There is nothing that gives me more joy. Now I will go. Now I have nothing to say. There are no last words. I have no anxieties. I was blessed with a good family. I was able to have good friends. Now I commence a glorious mission. My happiness is for the sole purpose of this. Now with calmness I go smiling. Finally tomorrow I will make the long-awaited sortie. I will participate in the general attack against warships at Okinawa. This probably will be the final letter. Now there is nothing more that I want to say. My feelings are in accordance with what you know from before. My current feelings are like those expressed in the above poem by the Emperor . With a refreshed feeling, flying my plane I will rush in and attack. I truly thank you for what you did for me for a long time. I earnestly pray that you please take good care of yourself. The letters come from Katabami (2014, 104-6). The biographical information in the first paragraph comes from Katabami (2014, 104) and Osuo (2005, 197). 1. The translation of this poem in tanka form (31-syllable poem with a syllable pattern of 5-7-5-7-7) composed by Emperor Meiji comes from the following web page: <http://www.meijijingu.or.jp/english/about/8.html> (May 21, 2018).